Thanks to everyone who came to the first meeting at Palas Print! We’ve decided to set up two groups, morning and evening – both meeting at Palas Print in Bangor. You can find Palas Print here. In the first book group we will be reading ‘Country Dance’ by Margiad Evans which you will find in Bangor University Library, Bangor Library or you can buy it from Palas Print. Country Dance presents a first person account of passion, murder and cultural conflict played out in the young Ann Goodman, who is torn by ‘the struggle for supremacy in her mixed blood’, Welsh and English. In this love story, set in the late nineteenth century, the rural way of life is no idyll, but a savage and exacting struggle for survival. If you haven’t already been in contact it would be great to hear from you if you’re thinking about joining either of the meetings. The first post of a brand new blog! 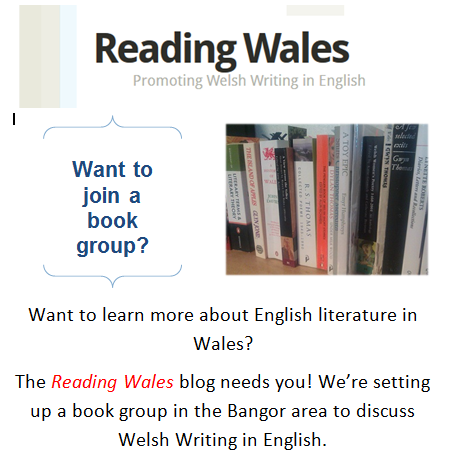 The aim of this blog is to get people interested in and talking about Welsh Writing in English. Over the next few months I will be blogging about various WWiE authors and texts and uploading details about the Reading Wales book group. I’ll also be using Twitter and Facebook to get the conversation flowing – what Anglophone Welsh literature should we be reading and why?